Our Speaker Stands are ideal for raising a set of speakers to a suitable height in order to project your sound. If you are hiring speakers from us we will always recommend stands that are appropriate for your event, either way we have a range of solutions that are safe and stable. What do speaker stands do? 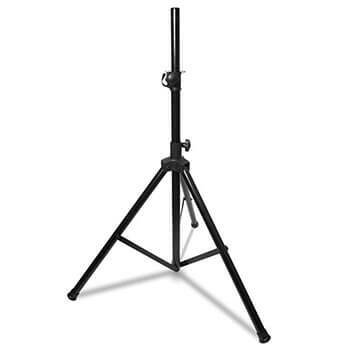 The purpose of a speaker stand is to direct the sound waves to the audience’s ears, thus reducing the actual power output needed as you’re delivering the audio in a more direct path to the listeners. Stands are also a great way of further arranging the speakers, not only just for what looks good, but what works for the room or space. Having different types of speaker at different heights helps to improve the sound quality by directing different frequencies to the user’s ears. It’s typical for bass speakers with low frequencies to be placed on the floor. This allows the bass sound to reach not just the audience’s ears but their whole body. Tops/mid-range speakers can be mounted on stands higher up to direct the melodies, speech and mid-range frequencies towards the users ears, while the bass bins on the floor or lower down create an overall loudness that travels through the floor and across the room towards their bodies. There are many suggestions by other professionals as to the ratio of bass bin to mid-top speakers on stands. One frequent suggestion is a 50% difference, meaning the output of the speakers on top of the stands can be 50% less than the bass bins on the floor due to the height at which they’re mounted and the way our ears (and bodies) interpret sounds. There are also a wide range of ‘skrims’ available these days if you’re worried about the look of the metal stands. Skrims are material coverings that fit over the stands hiding the bare metal which can be lit from underneath. They’re usually white in colour allowing you to light them up with whatever colour suits your production best.